We closed right on our 17195 target and then the Dow closed above 17143 providing another buy signal yesterday and that warned of a move further to the upside. Especially when we fell right to the Bearish Reversal at 15960 and held. Exceeding Thursday’s high is a serious issue. We now must realize that exceeding the September high intraday will signal we just may be in store for an awesome Sling-Shot Move to the upside – that’s a run-away that takes out the lows and then runs through the highs. On top of that, we may be making at least a Channel Move and possibly preparing for a Plateau Move. This is all fine and dandy to make money in stocks, but it is a devastating signal for a collapse in government and the monetary system that may be an under statement. I am not selling hype so I tend to downplay rather than exaggerate potentials to sell newsletters. The truth is bad enough – I do not need to spin it to sell stuff. I realize every government watches this blog. PAY ATTENTION for once!!!! This is going to be bigger than you! Think about your family and the future – not just holding on to power today. Tomorrow always comes. Today is the end of the month. 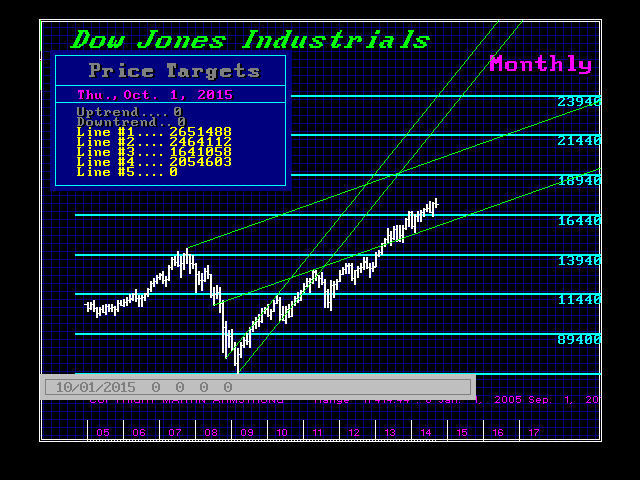 At the time of this writing the Dow has reached 17395. 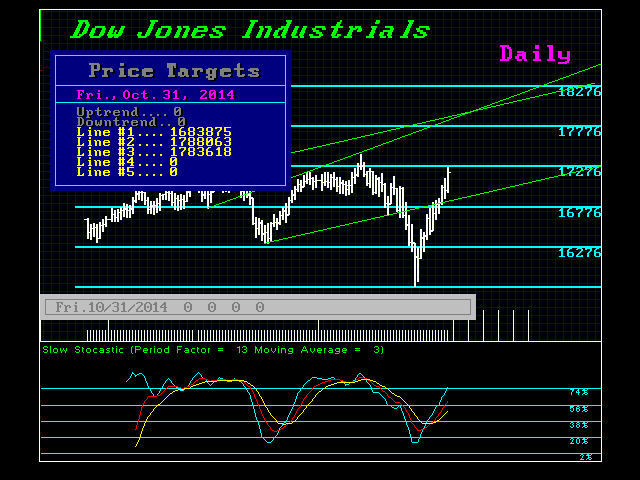 Exceeding 17414 – T O D A Y – will be awesome and closing above that will be VERTIGO-land. Even a closing today higher than September (which was 17042.90) will be a warning in itself we better pay attention here . This makes the minimum target at the 20k level but more likely the minimum becomes 24-26k. The full World Share Market Report will be moved forward. We will try to issue just an interim report on the Dow based upon the seriousness of these events. Next week remains the critical target and it appears that the Republicans may win the Senate and that could be very bullish for sentiment (although in reality nothing will really change). 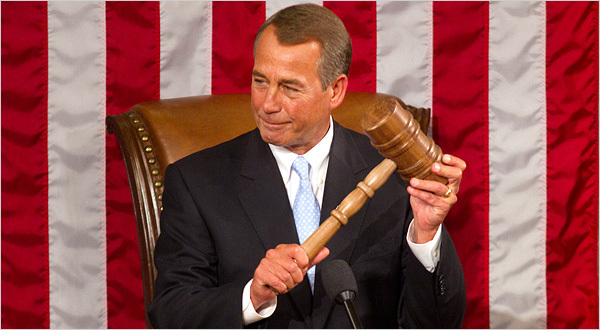 The key would then be the leadership battle in January and getting rid of John Boehner will be the real critical issue. He likes it as is and will NEVER consider change until it is forced upon him.